Keisha Alder ignored her sister Shandi's continued calls; she was in the middle of a job she had no intention of cutting short. The sharp smell of vinegar filled Keisha's workshop, but she was so inured to it that it hardly even stung her nose. Shandi could wait long enough for Keisha to finish decanting her bruise potion, staining out the bits of wormwood with a fine net of cheesecloth. Keisha wrinkled her nose a little as the smell of vinegar intensified; the books said to use wine for the potion, but she had found that vinegar worked just as well, and there was no mistaking it for something drinkable - unless your taste in wine was really wretched. A cloth steeped in this dark-brown liquid and bandaged against a bruise eased the pain and made the bruise itself heal much more quickly than it would on its own, so despite the odor the potion was much in demand. 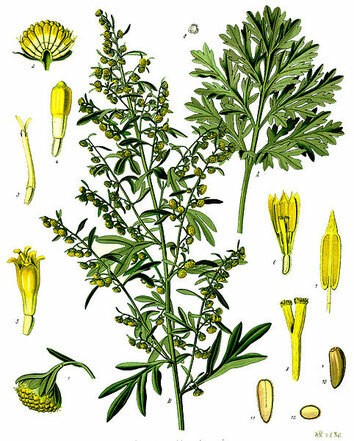 Wormwood (Artemisia absinthium) is better known for its healing properties where digestive disorders are concerned, but it has traditionally been used in poultices and salves to treat bruises and insect bites. It contains tanning and bittering agents, which have astringent effect and stimulate the blood flow, which could account for its healing properties where contusions are concerned. A medicinal plant's healing agents are usually extracted via alcoholic or oleaginous solutions, but vinegar also serves to extract most alcohol soluble ingredients, so Lackey's paragraph above is correct in that aspect, as well. The reference to using vinegar so the potion would be undrinkable probably refers to the fact that wormwood contains thujone, which can be toxic in high dosages. It may induce miscarriage and harm a nursing infant. The once-popular drink absinthe contained a high percentage of wormwood, and was said to cause hallucinations, resulting in the spirit being banned in many countries in the early nineteen hundreds. The ban has since been rescinded, though only if the thujone is below a certain threshold. 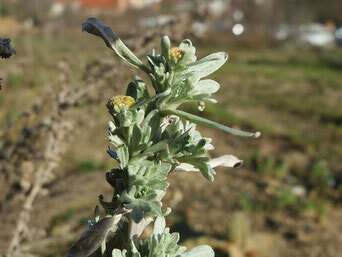 Traditionally, Artemisia absinthium was used to kill intestinal parasites, hence its name, wormwood. In modern times, the herb is mostly used to treat digestive disorders. Ingested as tea or alcoholic tincture, it counteracts poor appetite, supports the gall's function, and helps with indigestion (dyspepsia). There is also some evidence that it might help fight Crohn's disease. The HMPC conclusions on the use of these wormwood herb medicines for appetite loss and mild heartburn and stomach/gut disorders are based on their ‘traditional use’. This means that, although there is insufficient evidence from clinical trials, the effectiveness of these herbal medicines is plausible and there is evidence that they have been used safely in this way for at least 30 years (including at least 15 years within the EU). Wormwood poultices and salves have traditionally been used to treat bruises and insect bites, though no scientific studies have yet been undertaken to prove the herb's effectiveness for these indications. There is some empirical evidence that wormwood tea or tinctures are effective against digestive problems. Due to its potentially toxic ingredient thujone, wormwood should not be used excessively or over long periods of time. During pregnancy or while nursing the use of wormwood is contraindicated, and the herb should not be administered to children.